Food is a serious business here in Greece and in the recent months, Athens has been erroneously bombarded with all sorts of new entries in the food and drinks arena. Puts to show how passionate Greeks can be about their food, or how a whole new era of gentrification, globalization and other trends of the sort affect what we eat and what we drink! Luckily, we've been eating around quite a lot and can now report back on what's not to miss from all of the latest buzz in the city. First off, tradition. With immaculate interiors emanating some sort of a Greek vibe and a menu full of tasty bites to share, Cherchez le Femme right in the heart of Athens is probably one of the best new entries. Set in the middle of Mitropoleos street and tucked nicely in a colorful corner, the place caters to some demanding lovers of Greek food (hence the tourist trap effect from all sorts of travelers flocking its central location) so do budget accordingly and reserve a table beforehand. Sotiris Chronis and Fotini Goula launched this place back in March 2017, pulling together a wide range of familiar memories to create an allure of the old Athenian vibe where portions of meze-style food were smaller and more authentic. Make sure you don't miss out on the fresh lentil salad. Scorpina in Neo Psychiko is a great seafood place that has recently been added to the map. The team from fellow restaurant Atherina in Nea Erythrea has really nailed it calling Antigoni Kapsali for help to repurpose and freshen up the existing space. Chef Yiannis Liakou, a familiar face from the foodie streets of Thessaloniki, has created an exciting menu that will surprise you! No, it's not only the foreign-inspired dishes such as the tangy peskandritsa ceviche and the tender seabass carpaccio - it's every single detail on the menu that lives and breathes Greece, with a twist! With all the recent bizz bash around what's hot and what's new in Athens, it's so good to finally visit a place that's here to stay! Eclectic in its dishes, beautifully designed in its interiors and with such an impeccable service that most Michelin restaurants would be jealous of, Papillon in Neo Psychiko has already started becoming a classic. For starters, dig in to the rich steak tartare spreading every flavour of it on the lightly fried country bread that comes on the side. A juicy buratta with yellow pomodorini accompanies some good red wine quite nicely and off you go for the main courses. Pasta is quite good, albeit a bit pricey, with Duck Papardelle, toped with some shaved parmesan and sprinkled with the occasional black pepper seasoning, and potato gnocchi with sweet gorgonzola and grilled mushrooms. Full marks for both pasta to Yiannis Markadakis, the head chef of the team, who remarkably create some bold rich flavours out of some simple yet elegant dishes. By the way, you shouldn't miss out on the lightness of the Gateau à la Nougatine! Dimitris Litinas joins forces again with Kyrios Criton interior designer and recreates some of that vibe at Tha Se Kano Vasilissa down in Votanikos, Athens, in a wooden-roof warehouse that once housed a Volkswagen garage. Dimly-let lighting creates a perfect setting for dinner or drinks - mainly wine and rare malt whiskey that comes plenty. The menu is somewhat short apart from the long list of cheese and cold cuts but there are some daily specials so do ask! As for traditional Greek-style meze, Gakias showcases the perfect pantry and Greek produce in the suburb of Nea Erythrea. It opened in late 2016 with a menu that is lengthy and offers both fish and meat options. Along the way, we did get a chance to try out the hugely promoted Hoocut in Agia Irene's square, that was supposedly the new best street food in town. The verdict is in and so far it hasn't impressed us. Same goes for the joint forces of The Trap bar and Mezen from Volos, that offer a short list of tapas on Syntagma square. Oinoscent, on the other hand, the long established wine bar of Voulis street has expanded next door now offering a dinner service that is being looked after Sotiris Kontizas. Make sure you pop in for a lovely potato bacon truffle oil salad that resembles the good ol' π-box signature dish by Christoforos Peskias. If you're into meat you should go and try Farma Mprallou in Kolonaki during lunch hours in order to sample some of the great tender cuts they offer. Other than that there is nothing much to see or experience but that would do. Lastly, part of the team from the infamous Tilemachos steakhouse has now moved to the city centre (a few blocks down the street from Farma Mprallou) creating Tilemachos Athens. Fairly priced and decent in its offering it ticks the box! Koukaki has been lately getting more of our attention, as in the last couple of years a lot of carefully-crafted places have popped up. To name a few, Drupes & Drips, Lotte and, lately, 7 Cactus Greek Deli come to mind first! Perfect ambience and some tasty bites to go with it. For specialty coffee, Pefki proves a front-runner with Dizer (also offering brunch) as well as Exarchia with Kaldi. On the other hand, Metaxourgio has also been buzzing as the area gets more civilized... but there's still a long way to go before we see some pure quality down there. Yes, we loved Seychelles (although the staff can do with more better manners) and the backyard of Fill the Bracket is a nice one when you want to escape the roughness of the streets around. Though their brunch still needs a lot of work so best is you visit for coffee... or drinks at night. Speaking of drinks, Beauty Killed the Beast is indeed the best one around. Perfect space, with many different rooms, and barman Vassilis creates some funky cocktails and is a name to remember. Well done! Sometimes it feels great to go off the beaten path to discover new places, and Dizer in the northern Athenian suburb of Pefki is definitely a favourite one. Serving specialty coffee and homey breakfast/brunch treats, Dizer is a great hideout away from the crowds of Kifisia on lazy weekend mornings. You should try their hangover sandwich, made with fried eggs, bacon sourced from Drama, melted cheese and a bit of siraccha sauce! The huevos rotos (not exactly identical to the Spanish equivalent, but still very very good!) are runny fried eggs over baby potatoes. And, last but not least, their chocolate pancakes! The new Athenian Bakehouse in Kolonaki, Queen Bee, is the product of some hard thinking and a lot of work. Most of the focus was initially given to the baked goods of the house with chef Κamel Saci who's previously worked on places like Aubaine in London next to other French experts. With a slightly American fare - For Five coffee beans are being directly sourced from Brooklyn on a weekly basis- and the robustness of a French bistro, Queen Bee has all the buzz you could imagine for all-day dining and people watching. When you next visit, make sure you get early as the places gets extremely busy during weekend brunch. Luckily they're soon opening for dinner service too! 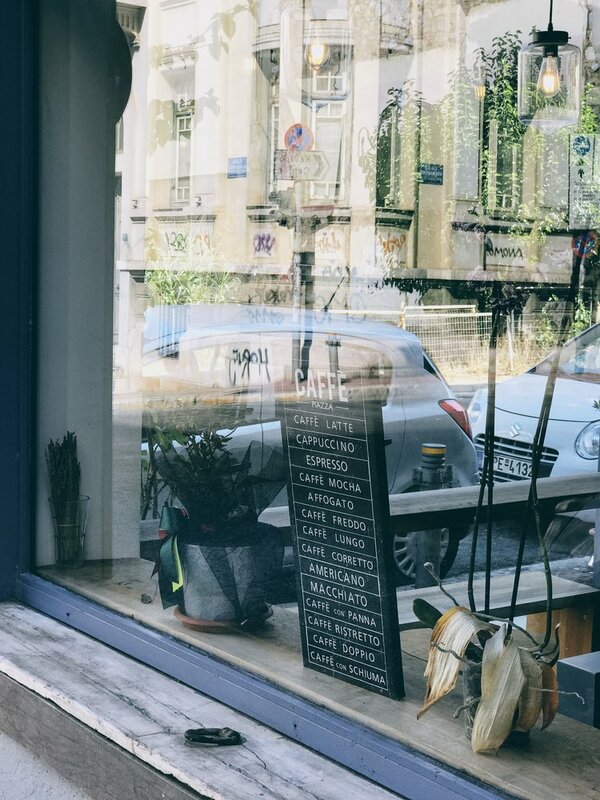 Kaldi is a tiny, yet ultra minimalist space opened in the busy outskirts of Exarchia in the early spring of 2016 primarily offering roasted beens, fine herbs and coffee to-go. Coffee aficionados, Konstantinos Anastasopoulos and Grigoris Tsekouras, wanted to create a space in the city centre where they could share their passion with the Athenian crowd. They sourced some high quality beans, created a cosy and ultra stylish space and branded the place accordingly. Hidden in the upper part of Dimitrakopoulou street, 7 Cactus is a spot you don't easily notice as it blends in the greyish backdrop of urban Koukaki. Laptop and newspapers at hand, we sit down in the long communal table of the front terrace that is uniquely decorated with (what else?!) cactuses! Most specifically, a bunch of prickly pear cactuses that put a nice touch of green in the otherwise black and white aesthetics. Locals are the first ones here early in the morning, as the team starts serving at 8am, with tourists and foodies stopping by to catch some of the food action. Tiny in size, colorful in decor and filled with a collection of heart-warming artefacts of a bygone romantic era, Lotte quickly overdelivers as soon you walk in. A slow-tempo nostalgic (and at times classical music) is playing, colorful vintage interiors and an elegant personal touch evident everywhere, from decor to orders being handed over the bar.